Wayne and I cycled 103 miles today, with the other riders completing a shorter loop. Starting in Spencer, we rode through the towns of Ayrshire, Curlew, Mallard, West Bend, Plover, and Whittemore to reach Algona. Three things caught my attention today. First, difference makers abound. RAGBRAI riders are unfailingly polite and upbeat. RAGBRAI is not a race, so there is no need for riders to compete with each other. Everyone is out to have fun at the same time as they test their physical endurance. Every minute I hear someone say, “Rider out. Rider in. On your left. Car up. Car back. 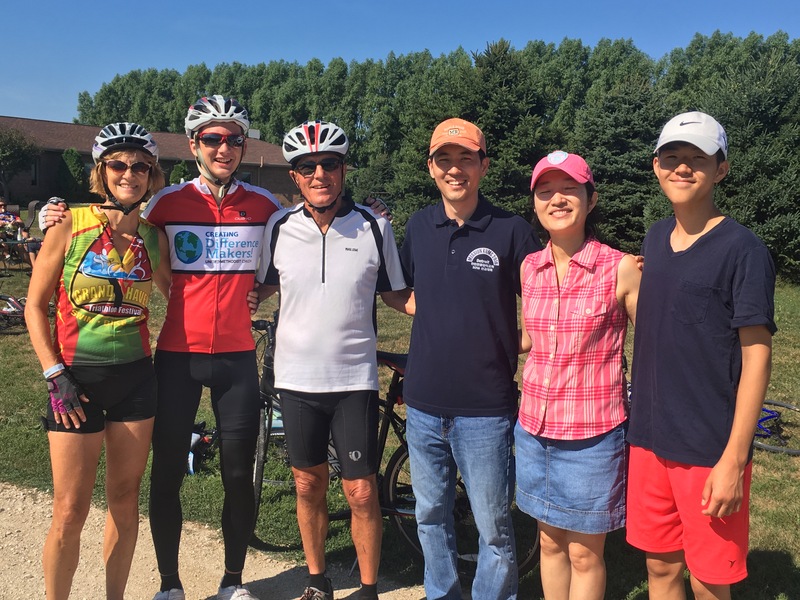 Good job!” Whenever someone goes down on their bike or has a mechanical issue, riders always stop to help and support one another. Because I am trying to be polite as well, I purchased and tried to eat a “walking taco” in a Doritos bag for breakfast. Regretfully, it will be my last walking taco ever. My favorite words of support are, “Rumble strip ahead!” On many rural roads in Iowa, there are three sets of rumble strips that warn drivers of a stop sign ahead. The problem is that they cover the entire lane and are very hard on bike tires. Warning riders ahead of time about rumble strips prevents many falls. More discerning riders will even say, “Good rumble strip!” or “Bad rumble strip!” depending on how deep the grooves are. 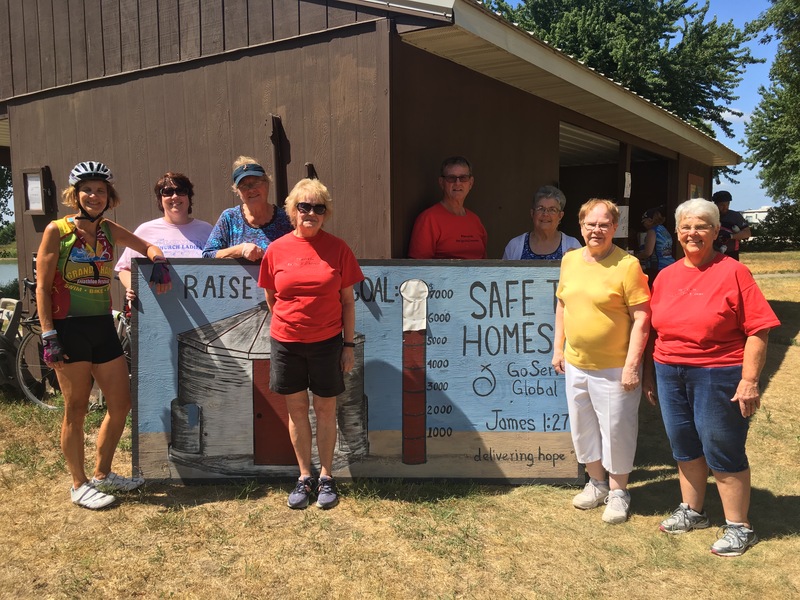 Second, the “church ladies” of United Methodist churches along the way have been very hospitable to RAGBRAI riders. Men are helping too, but lots of signs talk about the food that church ladies are selling. This morning we stopped at a roadside concession sponsored by Emmettsburg United Methodist Church and greeted their new pastor, Hojin Shin, and church members, Later in the day, we stopped at a park in Plover to eat the famous ham balls cooked by the Plover Hope United Methodist Church. All proceeds are going to mission. Difference makers. Third, our host churches and families have been unfailingly gracious to our RAGBRAI team of five riders and Wendy, our driver. Tonight we enjoyed a wonderful spaghetti dinner at Algona United Methodist Church, which is located in the center of town and welcomed hundreds of visitors to their Fellowship Hall. Again, proceeds are going to mission. We were graciously hosted overnight by Tom and Pat Larson. Difference makers. How will you be a difference maker today? Well, I was pretty surprised to see you holding a Doritos bag… (yuck!) I’m guessing nobody got the memo about your breakfast preference of cottage cheese and grapes. Strong work Laurie! My grandson, Seth is riding too. I told him to watch for you but there are thousands. Hope the weather is ice all the way. Walking tacos are not that bad, but never for breakfast! Yuck!! Never had them with Doritos (and also have not had one for at least 20 years). 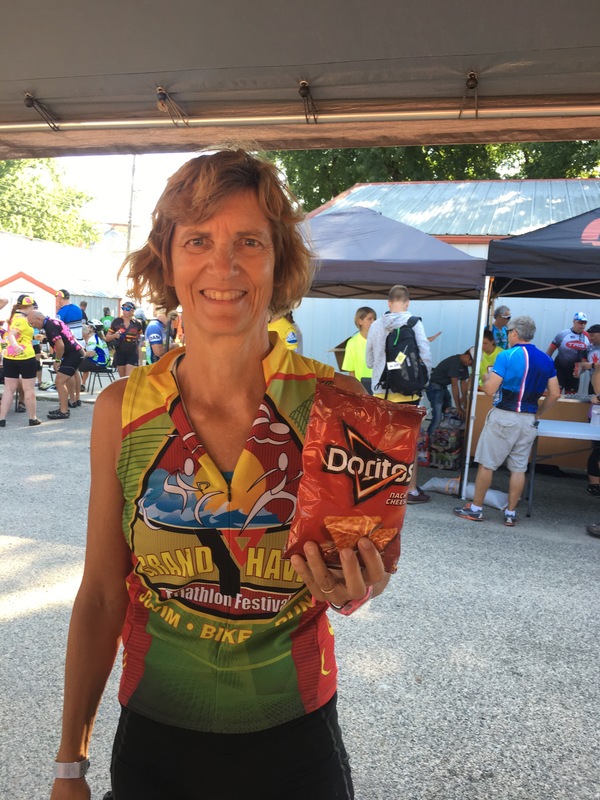 Glad you are doing RAGBRAI and hope that you continue to enjoy it. People I know who have gone on RAGBRAI all say you need to try the pie–at every UMC stand you pass as well as other church stands. Have fun!